Lowdown: A starship’s lesser characters become conscious of them being the fodder of another world’s ailing TV show. As stated rather conclusively in this forum before, I can confidently proclaim that at this moment in time John Scalzi is my favorite author of fiction. As such, I would dig a hole behind the poster on the wall and crawl through a football field’s length of refuse to put my hands on his latest book. Being the good person that he is, Scalzi doesn’t want me to go that far; he therefore worked his latest book, Redshirts, to be the first non DRM ebook published by Thor, who happen to be the world’s largest science fiction publisher. To show my appreciation, I set my VPN to stun and got *my* copy of Redshirts upon its world premiere. Premiere is a relevant word for dealing with Redshirts, as it happens to be yet another book where Scalzi throws his love for Hollywood into the mix (check Agent to the Stars for Scalzi’s past performances in the field of Hollywood science fiction). We start off on board the Intrepid, a very Star Trekish like Enterprise kind of a starship exploring the universe. Unlike the Star Trek we know of, Redshirts has us looking through the eyes of the lesser characters, the “red shirts” that accompany the Kirks and the Spocks on away missions only so someone could die and create a challenge for the series’ stars. Our red shirts realize something fishy’s going on; it is much too statistically improbable for the life expectancy of an Interpid red shirt to be as poor as it is and in such contrast to that of the Spock/Kirk. In a very Stranger than Fiction kind of a way, the red shirts decide to take the initiative. They figure out what the “true” nature of their star trekking experience is, and in the true nature of science fiction / fantasy they set out on a quest to sort things out in our 2012 real world so that life can take its natural course in what passes for their real world. As one can expect, this mixing of the fictional and the seemingly real opens the door wide to various philosophical questions of the existential kind, to be cleverly exploited by Scalzi through his trademark humor. Don’t misunderstand me, Redshirts is easy reading. It’s just that it lets its reader do the thinking for herself. There is plenty to think of; me, I was found thinking about the author’s view of the fictional worlds they created. Take god, for example: we’re supposed to be his creations, but why do most religions consider their god to care for them as much as they think he does? Do we care about the things we create half as much, or is our passion in the godly department the direct product of our wishful thinking instead? And on that matter of playing god: is there a Tron like world running on my computer now, as I am typing this post? Am I evil for deleting a mistyped word off this post, a word that may have some form of consciousness behind it, a word that might regard me as its god up to the point I go ahead and annihilate it without thinking twice? The ideas invoked by Redshirts are so interesting it is a wonder how no one else picked up on the idea prior to Scalzi. On the negative side, I also found Redshirts to be significantly less of a page turner than the two previous science fiction reads preceding it (The Drowned Cities and Blackout), which is always a bit of a let down. Redshirts puts so much of its focus on dealing with the complex idea at its core, ideas that no one alive today can resolve and that are in the forefront of philosophy (check Sam Harris’ Free Will as an example) that I found it hard to relate to its relatively numerous characters. Scalzi himself seems to have an issue there, as evident by the rather clumsy way he concludes the book. As Bioware would have told him through their Mass Effect 3 experience, fans are very sensitive to the way things end. Wait before you go and bury Redshirts, please, because Scalzi is yet to have his final word. In an atypical manner, Scalzi pads his book with three related short stories which he refers to as “codas”. Me, I am not a big fan of short stories, and generally speaking I am no big fan of Scalzi’s attempts thus far in the field of short stories. Redshirt’s short stories, or codas, are a different story altogether: they take the funny mess the main story left us with, and they tell us to forget all the way up there philosophy. They hold the reader by her shoulders and proclaim, Ecclesiastes style, that all is vanity; what matters is what we do with the life that is real for us here and now, the only life we have. This focusing act at the end of the book, done in such an unconventional yet so effective a manner, is exactly what I come to expect from Scalzi (and exactly what he achieved in his previous book, Fuzzy Nation). If one was looking for signs of a mature author at his peak then one need not look any further: it takes a special kind of confidence to pull the trick Scalzi does with his Redshirts. 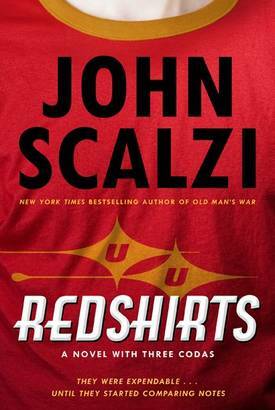 Overall: Another book from a clever writer, Redshirts is vintage Scalzi. It's got Hollywood, it's got the humor, it's got the cleverness, and it's got the damn good big idea behind it. I give it 4 out of 5 stars, but I urge you to go – no, rush – to buy it now, DRM free!